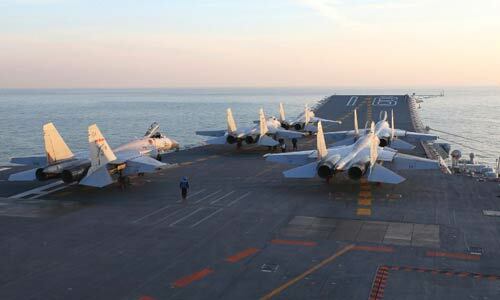 The ‘Asian aircraft carrier race’ now has a new dimension. The Chinese Navy’s first-ever sea-borne carrier, the Liaoning, has made its first foray in deep waters and docked at a bay in the disputed South China Sea. Purchased from Ukraine after the fall of the Soviet Union, the first-ever deep sea sail of the Liaoning was being watched with great interest in strategic circles in India, the US, Japan and Russia besides the countries which are locked in a dispute with China over territorial issues in South China Sea that is rich in hydro-carbons. The sail also means India, Japan and China now have a ‘flat-deck’ that can carry fighter jets which can further hit target at sea or land. As of now, India is the leader with 50 years of experience in operating sea-borne aircraft carriers while Japan, for the first time since World War-II, has made flat-deck warships but doesn’t call them ‘aircraft carriers’. China is the newest entrant. India’s INS Vikramaditya, a 46,000 tonne ship, is fully operational. A race between India and China to secure resources such as oil, minerals, natural gas and coal will be backed by keeping sea lanes open. For India, China’s intension to station the Liaoning in the disputed South China Sea — the only trade route between India and Association of Southeast Asian Nations (ASEAN) — will be vital. Beijing has an added advantage. Its deep ties with Pakistan and Burma, besides supply bases in Sri Lanka, can be useful for deployment of Chinese carriers in the Indian Ocean, placing its navy in waters which form a core interest for New Delhi. The third dimension is Japan. Following the end of World War-II and defeat of the Imperial Japan Navy, the Japanese Constitution in 1945 banned the making of aircraft carriers, but recently lifted it. In March 2015, Japan commissioned the 24,000-tonne flat-deck called Izumo for carrying 14 helicopters. It can easily carry and operate the vertical takeoff F-35B joint strike fighters being developed by the US. Meanwhile, the US adds the fourth dimension with its ‘super carriers’ of USS Nimitz class — each weighing over 1 lakh tonnes and nuclear powered — in Asian waters. President Barack Obama had announced in 2011 the rebalance of US naval assets that would entail stationing 60 per cent of its sea-going fleet in Asia-Pacific.